Safe Water Campaign: Aluminium + Fluoride = ? Aluminium + Fluoride = ? One point I think needs a better understanding is the reaction between the aluminium and fluoride. When looking into the causes of dementia aluminium comes high on the list of potential causes. However aluminium does not cross the blood/brain barrier, I am told. Aluminium with fluoride does, again needs confirmation. Therefore when aluminium sulphate is added to the water (as it is, to ‘clean it’) and then silicon hexafluoridealuminium sulphate is added to the water (as it is, to ‘clean it’) and then silicon hexafluoride (or tetrafluoride, which I think is a solid, or liquid hydrofluorosilicic acid, H2SiF6)?) is also added, one may expect a reaction between them, especially if there are free ions of each. Aluminium tetrafluoride may be produced or aluminum fluosilicate solution. Either seem potential culprits of the brain problems associated with both aluminium and fluoride (i.e. the combination may be much more dangerous than each separately). Aluminium and Silicon are right next to each other on the Periodic Table of Elements. An expert chemist’s view of this would be useful. Does anyone know a good one? 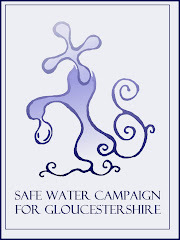 The Safe Water Campaign for Gloucestershire say NO to water fluoridation. We need your support to ensure that the Water Companies and the Strategic Health Authority don't fluoridate. The aim of the group is to campaign for safe drinking water, in particular to campaign against the fluoridation of our public water supplies. Dr Peter Mansfield, a physician and an advisory board member of the recent government review of fluoridation has said: "No physician in his right senses would prescribe for a person he has never met, whose medical history he does not know, a substance which is intended to create bodily change, with the advice: 'Take as much as you like to, but you will take it for the rest of your life because some children suffer from tooth decay. ' It is a preposterous notion." We at the Safe Water Campaign agree. Hexafluorosilicic Acid is a registered Class 2 Poison under the Poisons Act 1972. It is comparable to the deadly weed killer Paraquat which has no known antidote and has now been banned from sale to gardeners. It is not certificated as a medicine. How could it be? The current level of one mg per litre of fresh water is around ten times the concentration of natural and harmless Calcium fluoride, often found in natural water sources. Fluoride - protected pollutant or panacea? Try these links - be well informed!